There isn’t really a universal price point as it can vary greatly depending on where you’re located. Typically speaking, however, you’ll find that most installers have granite countertops cheaper than quartz. While this might discourage some, especially if you’re building on a budget, ultimately it comes down to what you’re planning on doing. Kitchen islands are a good example of this. Slabs of granite tend to be bigger than quartz slabs. You’ll be able to find granite slabs in the 6 to 10 foot range, where quartz typically comes in at 4 to 6 foot range. So if you’re considering building an island, keep the dimensions in mind. Nothing ruins the aesthetic appeal of your countertop faster than poorly done seams. While seams are necessary, a good installer can minimize the impact of a visible seam on your countertop. Running a seam through the middle of an object such as the sink or the cook top means you have a smaller and less noticeable seam. When it comes to the decision between quartz and granite, you’ll find that quartz has an advantage here. Due to the nature of quartz, it has small inclusions and specks of color which can be easier for the installer to match up. 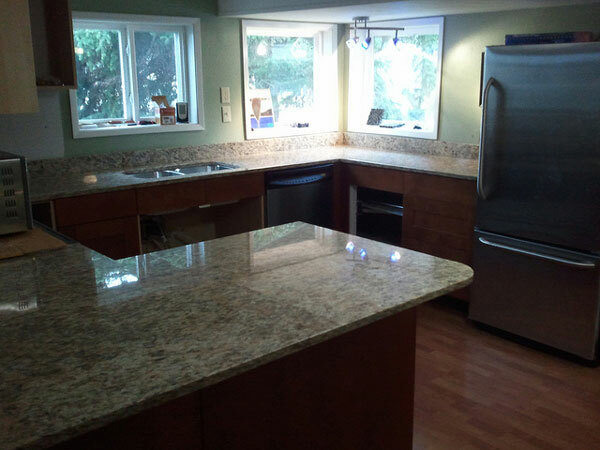 Granite on the other hand, has veins that run through it, which can be more difficult to match up in a way that doesn’t make it a glaring eyesore. Here’s where the choices get tricky. It’s important to make sure you’re working with a quality installer. It really doesn’t take much to mess up a nice new countertop. So when it comes time to deciding which installer to go with it’s important to remember, you get what you pay for. Do your homework and look up the quality of work your potential installer does. Ask your friends or neighbors who they used, especially if they have granite or quartz countertops. It’s always worth the extra effort, especially for how much it costs to have them installed to begin with. There’s probably a reason one installer offers to do the countertops cheaper per square foot than the rest. Finding an installer who can do the job right is worth the extra hassle, especially as it will most likely save you money later on down the line. Overall, the choice between granite and quartz comes down to your personal taste and preference. Quartz might cost a bit more on the outset, but is easier to match up. Granite, while harder to match up, is less expensive and allows you to use bigger sizes when it comes to islands and countertops. In either instance, the most important part is to choose something that will make you happy for years to come.